Bungie will be making some huge changes to Destiny's weapon balance in an upcoming patch. Some of your favorite Exotic weapons will be weakened significantly. "Fair warning: Some of these changes are intended to make you feel better while killing with the weapon," said Bungie sandbox designer Jon Weisnewski. Hard Light is being improved across the board in the patch. Its stability is being boosted from 65 to 80 so it's easy to hit your targets. Its projectiles will bounce more when hitting hard surfaces. Furthermore, these bullets won't be affected by damage fall-off so long-range shots will hit for the normal amount of damage rather than half. Acquiring the Necrochasm is a long and arduous process but the gun doesn't seem worth the work right now. Bungie has decided to boost its stability and magazine size. Furthermore, its Cursebringer perk has been improved. Now Cursed Thralls will always blow up when you kill them with a precision shot. The size and damage from this explosion has likewise been increased. Bungie intended for the Last Word to be a deadly close-quarters weapon. However, it's way too effective for long-range sniping as well. This has made the Last Word the fastest time-to-kill primary weapon in the game. The developers don't want you to use only one weapon for all situations, though, so this gun will take a hit in both range and stability. On the bright side, you'll be more accurate and cause more damage while firing from the hip. Bungie's main issue with hand cannons is that players are able to use them like sniper rifles. Thorn, like other hand cannons, is having its long-range damage and zoom reduced. The damage-over-time effect of Thorn is also being tweaked. Its base damage has been reduced by a third, but it can stack up to five times through multiple shots. By decreasing its burst damage but increasing its sustained power, Bungie will make the DoT better for PvE but less effective. Fighting an opponent armed with a Hawkmoon is extremely frustrating. This Hand Cannon has two perks - Luck in the Chamber and Holding Aces - that boost random shots. If lucky, a player with Hawkmoon can one-shot someone at full health. Bungie reduced the absurd burst damage of the weapon by lowering Luck in the Chamber's damage bonus slightly and limiting the stacking effects of Hawkmoon's perks. On the bright side, Holding Aces will now add two rounds to the gun's magazine when unlocked. Ice Breaker has always been one of the most sought-after sniper rifles in the game. In addition to being a powerful precision gun, it can regenerate its own ammo. There's even a chance that the gun will replace ammo from missed shots. Bungie loves the regenerating ammunition mechanic - and the tension of waiting for a new round to appear in your gun - but thinks it's too potent right now. The rifle will generate a new bullet once every eight seconds, rather than once every five. Destiny's development team has noticed that players consider No Land Beyond to be a joke. They think it's so bad that they use it only to show off their skill in the Crucible. While it can be effective for run-and-gun sniping in the Crucible in the right hands, No Land Beyond really isn't a viable option for PvE. Bungie is increasing its weapon handling speed to make it easier to use. The developers are also boosting the precision damage and time duration of its normal damage bonus from The Master perk. Additionally, a visual bug with its sights will also been fixed. Bungie seems to consider the Black Hammer an honorary Exotic because of how much players love it. 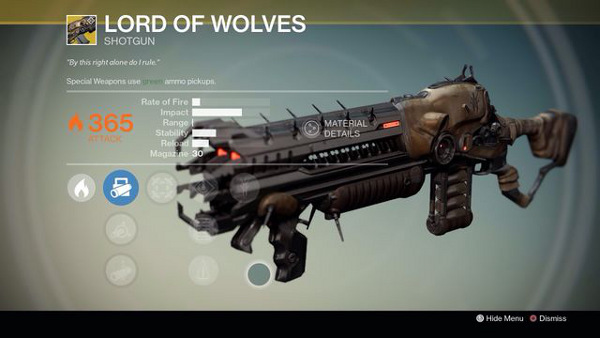 The rifle, acquired from Crota's End, is valued because of its ability to rip through bosses. Like the Ice Breaker, the Black Hammer's ammo is being reworked by the patch. The White Nail perk, which refills the player's magazine after they land three precision shots, will now take that ammo from your inventory. To balance out the lack of free ammunition, Bungie will allow players to carry 18 bullets for the gun. Lord of Wolves is in a good spot, in Bungie's opinion. They're not happy with Devil's Touch, a perk for that shotgun that boosts nearby allies' recovery for 30 seconds after a kill. The intent behind this perk was to make teammates stick together. To ensure that players do so, Bungie is tripling its recovery bonus. Gjallarhorn is arguably the gun most valued by players looking to do Raids and Nightfalls. Bungie noticed that some groups for these activities wouldn't allow teammates that didn't have the weapon. According to their data, over a quarter of players were using it in PvE challenges. The developers don't want this weapon to feel mandatory for high-level activities so they're going to make it a little less useful. The gun's Wolfpack Rounds, which split into cluster missiles that track down enemies on detonation, will have their damage reduced.